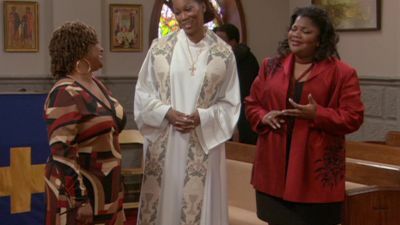 Here's where to watch every episode of The Parkers season 5. Mouseover or tap an episode to see where to stream it. Click or tap the play icon to stream it on the best available service. Til Death Do Us Part---And Make It Soon Sep 15, 2003 When Nikki discovers Professor Oglevee's secret honeymoon whereabouts, she sneaks aboard their yacht to try to win him back only to discover that Stanley's new wife, Paris, is plotting to murder him for his inheritance money. Meanwhile, Nikki also begins to realize how lonely she is since Kim moved across the country to be with her boyfriend. Squatter's Rights Sep 22, 2003 Professor Oglevee goes broke after his inheritance is swallowed by his uncle's back taxes, forcing him to move in with an elated Nikki, who is convinced this is the first step towards marrying him. But Andell is not so sure. A Plot with a View Sep 29, 2003 Nikki buys a burial plot for herself and Professor Oglevee from a shady undertaker. Meanwhile, Stevie and T hire a new singer for the band in order to replace Kim. Mama, I'm Baaack! Oct 6, 2003 Kim surprises everyone when she returns home from Harvard, but since Nikki has rented out her room, she and Andell come up with a scheme to force out the new nightmare roommate, Erica. Meanwhile, Professor Oglevee becomes obsessed with an illegal pyramid-like scam that T convinces him to join. The Accidental Therapist Oct 13, 2003 Nikki blackmails Professor Oglevee into attending therapy sessions when her testimony is required to prove a car accident wasn't his fault. Meanwhile, T and Stevie enlist Kim's help to snap celebrity photos for a tabloid. The Mack Is Like Wo! Oct 20, 2003 Professor Oglevee goes on a dating game show where America will choose one of four fine--yet somewhat freaky--women he'll go on a date with. To his horror, Nikki swindles her way on to the show as one of his potential dates. Meanwhile, Kim, Stevie and T open a smoothie stand on campus, but after several failed attempts at finding the right flavor, Kim stumbles upon Grandma's delicious and quite intoxicating secret formula. Kimmie Has Two Moms Nov 3, 2003 When Kim and Nikki win a guest appearance on their favorite daytime talk show, ""Zorah,"" Andell must sub in as Kim's mom when Nikki gets sick on the day of the show, but when Nikki comes bursting into the studio also claiming to be Kim's mom, Zorah continues the show assuming that Andell and Nikki are lesbian mothers. Meanwhile, Professor Oglevee agrees to play Cyrano de Bergerac so T can charm a beautiful older woman. I Never Rapped for My Father Nov 10, 2003 T's dad Thad, a former member of a one-hit wonder group, comes for a rare visit hoping to start a new band with his son, and T is forced to decide between joining his dad or sticking with his band Freestyle Unity. Meanwhile, Andell finds herself in a real bind with Nikki when Lurlene, her cousin visiting from Louisiana, accidentally makes a date with Professor Oglevee. Foul Ball Nov 17, 2003 Determined not to lose another annual softball game to the boys, Kim, Stevie and Nikki recruit Olympic softball player Jennie Finch as a ""ringer"" to help them win, forcing Professor Oglevee and T to get a ""ringer"" of their own, former Cincinnati Red and World Series champion, Eric Davis. Cheaters Never Prosper Nov 24, 2003 When Nikki becomes Professor Oglevee's teaching assistant, she butts heads with the pretty young student who flirts with him for special treatment. Meanwhile, Kim, Stevie, T, Regina and Freddy compete for $5,000 by volunteering for a psych study in which they are forced to live for three days in cramped quarters. Out with the Old, In with the New Dec 15, 2003 When Stevie's mom brings home her new and much younger boyfriend, Stevie accepts an awkward invitation to join him for a more private meeting. Nikki suspects that he may be interested in more than friendship and convinces Sophia to spy on them. Meanwhile, Nikki enlists the gang's help in throwing a garage sale, but Professor Oglevee initially refuses to get involved until he realizes that there is money to be made. School of Hard Knocks Jan 12, 2004 When local DJ's Shag and Tone pick Kim as their new ""on-air hottie with a body,"" a bitter rivalry erupts between the two radio jocks as they both secretly vie for Kim's attention. Meanwhile, Nikki fumes after Andell becomes Professor Oglevee's star student. Can Two Wrongs Make a Right? Feb 9, 2004 Nikki is up for a need-based scholarship to a university, but it is put in jeopardy when the school's representative shows up early to interview her and finds her at Andell's during a party gone wild. Also, Professor Oglevee lies about being a single dad in order to date a beautiful single mom. She's Positive Feb 16, 2004 When Kim and Stevie take T to a Murphy Lee show to celebrate his birthday, T meets and falls head over heels for Kai the girl of his dreams, but before things start to get hot and heavy between the two, she reveals that she is HIV positive. Meanwhile, Professor Oglevee enlists Nikki's catering talents to help impress a visiting team of representatives from a high profile university that is considering him for their Vice Presidency. Judge Not a Book... Feb 23, 2004 After Nikki tells an author tales of her ""love life"" with Professor Oglevee, the author convinces Nikki to write her own book about it all. The book becomes a best-seller that has love-starved women chasing after Stanleyâ€¦now Nikki must devise a plan to scare them all away from her man. Meanwhile, Kim assists the head stylist for a super obnoxious super model. Practice What You Preach Mar 1, 2004 An old friend from Nikki's wild days visits who is now the new Rev. at Nikki's church. Her promiscuous past causes turmoil in the church, which forces Nikki into the role of peacemaker. Also, Professor Oglevee gets Kim to coach him for a singing audition with the chorale group so he can join them on an exotic trip to Spain. Could It Be You? (1) Apr 26, 2004 With Nikki always around, Andell is desperate for some alone time with her new boyfriend Lester, so she secretly arranges a blind date with Johnnie for Nikki, who is shocked at the idea of possibly cheating on Professor Oglevee, but Nikki's resistance gradually turns into attraction when she and Johnnie realize how much they have in common. Meanwhile, Mavis turns down Woody's marriage proposal, which sends him into a funk and causes him to move out---and in with Professor Oglevee. A Little Change Never Hurt Anybody (2) May 3, 2004 When Nikki and Johnnie's relationship starts to get serious, Johnnie gets offered a job in New York, but instead of leaving Nikki behind, he asks her to marry him. Meanwhile, Kim, unable to graduate because she doesn't have enough credits, enlists Stevie's help to start her own design business instead. At Last (3) May 10, 2004 While the plans are underway for Nikki's wedding to Johnnie, Professor Oglevee finally realizes he is in love with Nikki and is determined to stop the wedding, until Andell stops him first. Meanwhile, Stevie and T finally graduate from school.